The struggle against apartheid in South Africa was perhaps the greatest transnational social movement of the post-World War II era. Figures like Nelson Mandela are rightly associated with this history, but the Left is less often remembered. The book and forthcoming documentary London Recruits offers a corrective to this. Both serve as a reminder of the tremendous importance of leftists in the global struggle against apartheid. People like Tom Bell and his South African “trainer” Ronnie Kasrils, who organized the London Recruits, a group of international activists who embraced a working-class radicalism that was internationalist, cosmopolitan, anti-imperialist, and anticapitalist — and most important, steadfastly opposed to legalized racial oppression in South Africa. This aspect of the struggle remains largely unknown, in no small part because the missions were secret and many of the participants did not know each other’s identities until decades later. However, these men and women, nearly all of whom were leftists, helped keep the fight to overthrow apartheid going during a “quiet decade” in which ferocious repression temporarily had shut down domestic opposition. Though supportive of the Soviet Union and its allies, Bell belonged to a new generation of Communists emerging in the 1960s, both in the West and inside the Communist bloc, who rejected Stalinism. Bell and others like him in the British Young Communist League (YCL) wanted to combine Marxism with the vibrant pro-peace, anti-imperialist ideals of the youth generation rising in the 1960s across the planet. Enter the handler. Ronnie Kasrils’s half-century of activism on behalf of racial equality and socialism is well known in his native South Africa, if far less so outside of it. Born to Jewish parents, Kasrils became radicalized in 1960 by the Sharpeville Massacre, in which at least sixty-nine unarmed black people were gunned down (mostly in the back) by the South African police. Their crime? Peacefully protesting the hated “pass laws,” one of apartheid’s primary enforcement tools. After the massacre, Kasrils joined the South African Communist Party and helped found Umkhonto we Sizwe (Spear of the Nation, or MK), the underground, armed wing of the African National Congress (ANC) headed up by Nelson Mandela. Kasrils participated in MK’s first actions in 1961 and helped lead its efforts in Natal province. Already banned from all political activity and witnessing the massive repression carried out against all anti-apartheid activists and organizations, the ANC itself went into exile under the leadership of Oliver Tambo, who along with Mandela and some other black activists, had reinvigorated the ANC in the late 1940s and 1950s. Tambo dispatched Kasrils to expand operations from London. As Kasrils told me, despite being ten thousand kilometers from South Africa, London was “so dynamically connected with Johannesburg and South Africa” that it seemed much “closer” than ANC offices in Dar es Salaam, Tanzania and Lusaka, Zambia. London became “home” to South African exiles (black, Indian, and white), was the headquarters of British finance and mining corporations that invested in South Africa, and served as South Africa’s major transportation link to the world, via ship and plane. To raise global awareness about the horrors of apartheid and increase pressure on the white minority regime, in the late 1960s Kasrils recruited and trained English and other young white radicals (from Europe and four, including Danny Schechter, from the United States). Usually in teams of two, they flew to South Africa, pretended to be tourists sympathetic to apartheid, and undertook missions to remind black South Africans that despite their suffering and the nearly complete destruction of opposition inside South Africa, they did not stand alone. The missions included everything from bold public actions proclaiming support for the ANC to transporting weapons for freedom fighters to helping those fighters sneak into the country. The London Recruits’ mission was not insignificant. Kasrils provides the context inside South Africa: “Post 63–64 or so, the Rivonia Trial [that condemned Mandela and seven other activists to life in prison], the arrest of leaders (Mandela and company), the roundup of thousands, people in the prisons and in exile, the underground apparatus in the country absolutely smashed.” The ferocity of the repression resulted in what historians now refer to as the “quiet decade,” when many thought all opposition had been smashed. This was a period when the movement regrouped; those not killed, imprisoned, or banned went underground, while others like Tambo into exile. As Kasrils recalled, “we needed to get a message across to our people that the ANC, the liberation movement, was alive, that people should not give up hope.” Leftist foreigners could help deliver that message. Where did Kasrils find young white radicals like Bell? Some were trade unionists, others students at the London School of Economics, but most came from the Young Communist League. When Kasrils arrived in London in 1965, he reached out to the British Communist Party. They, in turn, introduced Kasrils to the YCL leadership, who identified recruits including Tom’s older brother, Ron. Communists were familiar with “clandestine activities” and already internationalists. They were prepared for the kind of activism Kasrils believed was needed in the regroupment period. Like Tom, Ron Bell was introduced to left politics by their Communist parents. In 1970, Ron asked his younger brother to pair up on a mission into the belly of the apartheid beast. Before going to South Africa, though, Tom had already participated in antiracist politics. In the 1960s, like today, some white people hated the growing diversity of England — specifically black people from Britain’s former colonies in the Caribbean. Tory MP Enoch Powell delivered a notorious diatribe in 1968, now known as the “Rivers of Blood” speech. Powell lambasted England’s immigrant black people, fearing they would take over the country. Only eighteen, Bell took to a soapbox at his local shopping center in southeast London to attack Powell’s racism. He believed that hatred between racial groups meant that those groups could never unite to fight for socialism, Bell’s ultimate goal. Still in his teens, as an activist in the YCL, Bell traveled to Communist countries including Bulgaria, the Soviet Union, even North Korea. Once recruited by Kasrils, he needed a new passport because apartheid South Africa would never knowingly allow him into their country with such an array of stamps. Tom remembers his first meetings with Kasrils, who possessed great charisma and that particular South African accent of English. 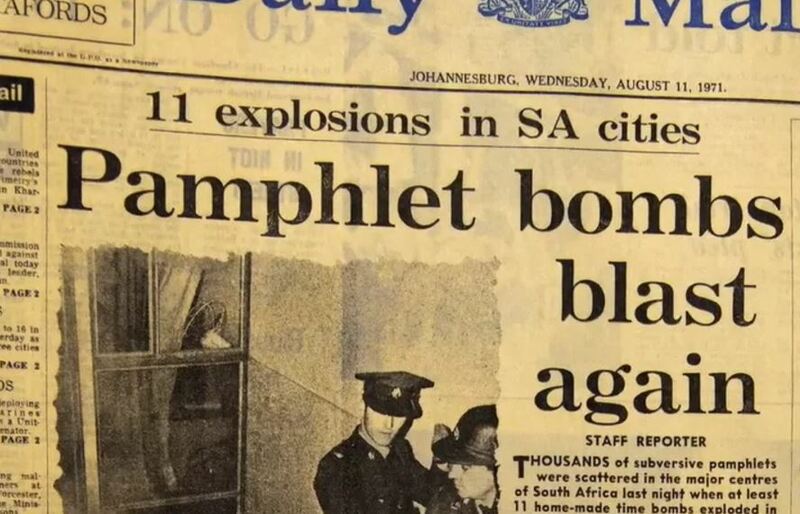 Using his own MK training and experience in constructing, planting, and detonating explosives as well as carrying out propaganda incidents, Kasrils taught the Bell brothers how to build a bomb in a five-gallon bucket, designed not to injure anyone but to spread ANC leaflets in public places in South Africa, as well as how to rig a cassette player to spread messages via loudspeaker. In 1970, the two flew to Cape Town by way of Johannesburg. They spent a week establishing their credentials as tourists while getting the lay of the land and acquiring some equipment to supplement what they had smuggled into the country. They identified locations to stage their actions: a railway station and busy plaza, places where thousands of black people passed by in their daily routines. Though its primary victims were those whom the apartheid regime called “non-Europeans,” the Bells also saw how apartheid hurt white people. While on a local bus, a white person suffered a heart attack, but the driver refused to deposit him at the closest hospital, reserved for blacks only. Before leaving the country, they learned that their comrades, other teams of London Recruits — who they knew existed but knew neither their identities nor plans — had launched similar actions in Durban, Johannesburg, and elsewhere. The Bell brothers returned to London where they continued their work in the British anti-apartheid movement. Peter Hain, a South African exile, became the public face of the movement, leading a successful effort to get the South African cricket and rugby teams banned from Britain. Kasrils and others in the ANC operated more clandestinely, as one of the major nerve centers for global organizing against apartheid that grew in the 1970s and exploded in the 1980s, with multiracial democracy finally emerging in 1994. The anti-apartheid movement might be the most impressive global social movement in the post-WWII world. In recent years, historians and other scholars finally are devoting attention to this inspirational and transnational history. Among historians outside of South Africa, much more work has been done on religious groups, Pan-Africanist black people in the United States and elsewhere, students, and (to a lesser and insufficient extent) unions. But the Left must be acknowledged in its own right for its crucial role in the resistance. It was no coincidence that Kasrils found Tom and Ron Bell ready, willing, and able to risk their very lives to fight apartheid. For people like the Bell brothers, Kasrils, and most in the liberation struggle, overthrowing apartheid was only the first phase of the revolution. The second would be the fight for socialism. In antiracist struggles around the world, the Left has played a vital part, from the American civil rights movement — historian William P. Jones highlights that the March on Washington for Jobs and Freedom in 1963 was “organized by a coalition of trade unionists, civil rights activists, and feminists, most of them African American and nearly all of them socialists” — to the anti-apartheid movement inside South Africa and beyond, which was led and populated by leftists including members of the Communist Party. (This explains why Ronald Reagan and Margaret Thatcher called Mandela a “communist” and opted to back the apartheid regime). The London Recruits also were committed to this goal. The filmmakers at Barefoot Rascals, a Welsh company, are currently at work on a documentary on the subject, having interviewed most of the surviving London Recruits and undertaken several trips to South Africa to interview activists and witnesses to the recruits’ efforts. Their story deserves a wide audience.